I’ll be blunt – it is up to Latinos to stop Donald Trump. Our opportunity comes on November 6 when we must elect leaders who will stand up to a man who has unceasingly vilified our community. Here in New Jersey, we are privileged to have an enviable group of Democratic candidates. In fact, the top of the ballot is one of our own – Senator Bob Menendez. While he has been a proven fighter on behalf of better health care, gun safety measures, and immigration, his opponent, Bob Hugin, is fighting against us. Look at Bob Hugin’s record. He is a top supporter of Donald Trump. In fact, during the 2016 presidential campaign, he donated over $200,000 to Trump. Hugin did this even after Trump called Mexicans “rapists” and even after he bragged about sexually assaulting women. But we shouldn’t be surprised by Hugin’s actions. He has been devoted to extreme Republican causes his entire career. He has donated thousands to the Heritage Foundation, a right-wing organization that rejects any common-sense gun safety measures and has taken a racist stand against comprehensive immigration reform. Moreover, the organization has repeatedly attacked unions and public schools. How could Bob Hugin support a candidate and organization that are so out of touch with New Jersey values and think he is still qualified to represent our incredibly diverse state? His poor political record is only surpassed by his horrible business career. While the head of a Big Pharma company, Hugin took dead aim at cancer patients. Specifically, Hugin doubled the price of the cancer medication Revlimid to over $18,000 a month. In 2017 alone, he raised the cost of Revlimid three times. Hugin and his company were also forced to settle with the federal government for $280 million for swindling cancer patients. Meanwhile, he was given a salary of $140 million and then bought three houses and a yacht. Additionally, he stood outside the White House after meeting with Trump and praised Trump’s health plan to repeal the Affordable Care Act. That would again hurt New Jersey’s most vulnerable residents. 3.5 million New Jerseyans with pre-existing conditions could lose their health care. Why does Hugin keep preying on our neighbors that need the most help from our government leaders? As bleak as Hugin’s record is, Senator Menendez’s career of representing us is undoubtedly bright. He is with us on issues we care about, and he has delivered time and again. First and foremost, he was a leading voice in passing the Affordable Care Act. He stood with President Obama and made sure New Jerseyans received increased access to affordable health care. He has also stood up to Trump and the Republican Party. He voted each and every time against the efforts by Republicans to repeal the Affordable Care Act. Senator Menendez is also pushing to hold people like Bob Hugin accountable. He is cosponsoring important legislation that will no longer allow pharmaceutical companies from blocking affordable, generic drugs from entering the market. That is the kind of leadership we need. And Sen. Menendez never forgets his roots. His parents fled Cuba as refugees and settled in New Jersey. He was a product of public school and rose to become the first statewide Latino leader in the state. He has always looked out for people who are also trying to live the American Dream. Exhibit A is his work on comprehensive immigration reform. In 2013, he worked with Senator John McCain and six other senators from both parties in order to create a path to citizenship and other improvements to our immigration laws. While it passed the Senate, far-right Republicans in the House stopped the bill from reaching President Obama’s desk. Had Bob Hugin-funded Republicans signed on to the common-sense bill, we would not have Trump vilifying our Latino community and so many of our brothers and sisters would be living better lives. 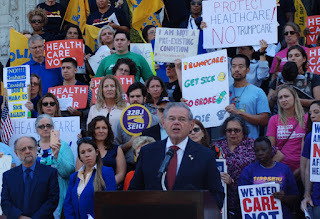 So, the choice should be clear, and it is why my organization, the Latino Action Network, did not hesitate to endorse Senator Menendez. We need a true progressive who isn’t afraid of Trump and who will vote to represent our interests. See you at the polls on November 6.